Do you worry about how the poisonous chemicals in your home might be affecting you or your children? Are you worried that your cosmetics or cleaning products might be carcinogenic? Would you like practical, cost-effective methods for detoxing your home? 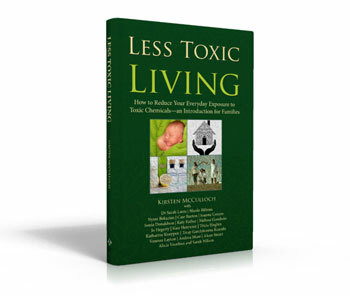 Less Toxic Living: How to Reduce Your Everyday Exposure to Toxic Chemicals – An Introduction for Families is a down to earth book that will help you limit your family’s exposure to dangerous chemicals in your home, cleaning products, food & water, cosmetics & skin care, and plastics. Theory and practical advice on all these areas and more. With contributions from nineteen different authors, including the authors of Healthy Home Healthy Family and bestseller Chemical Free Kids, this book provides a user-friendly introduction to a range of issues and effective solutions, with ample references for more in depth information. Less Toxic Living also includes free bonus downloads that will help you put the information you learn into practice in your daily life. More and more research is revealing the links between our everyday use of chemicals and increasing rates of cancer, allergies and behavioural disorders. Less Toxic Living arms you with workable solutions to protect your family. “I will give it five stars.” Gavin Webber of The Greening of Gavin. Less Toxic Living has five stars on Amazon too, where it was a bestseller on release! You can get Less Toxic Living for free in PDF format right here. Or, you can purchase the kindle version from amazon.com for only US$2.99, amazon.com.au for only AU$3.99 or the paperback version from a variety of outlets - I use bookfinder.com to find the best price for print books (with shipping, in your own currency), but they are not absolutely comprehensive, so if you have a favourite online bookseller, make sure you check there first.